I figured I would give you more inspiration for Toni's "Do something with a bag". Well...I did something. Altering a bag? hmmmmmm....I've done this before. Didn't turn out so well, so here was my chance for redemption. 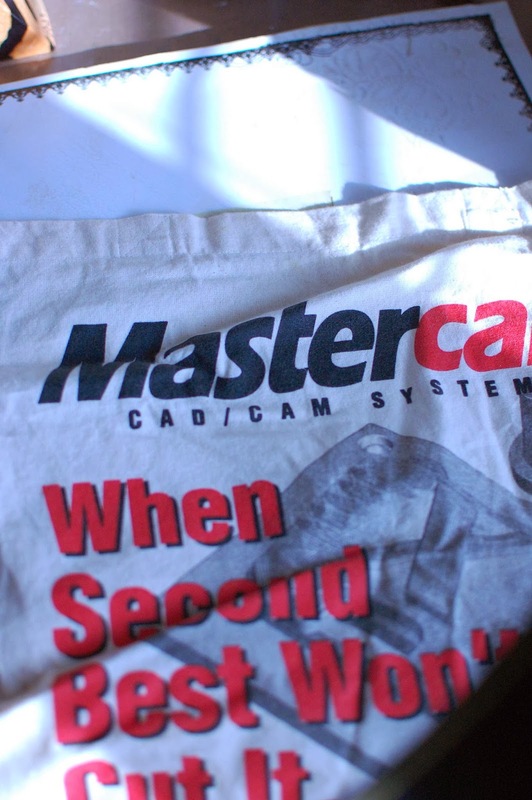 First, I dug out this Master Cam bag that my hubby brought home from a machinist trade show about a decade ago. I decided I didn't want 2 handles so I started by using my seam ripper to remove the handles that were sewn on. In order to cover that gawd awful picture I decided I would cover the thing in gesso. Remember when working with fabric to place a piece of cardboard in between your layers to avoid bleeding and soak through. Here I just used an insert from a 12x12 Prima mask. 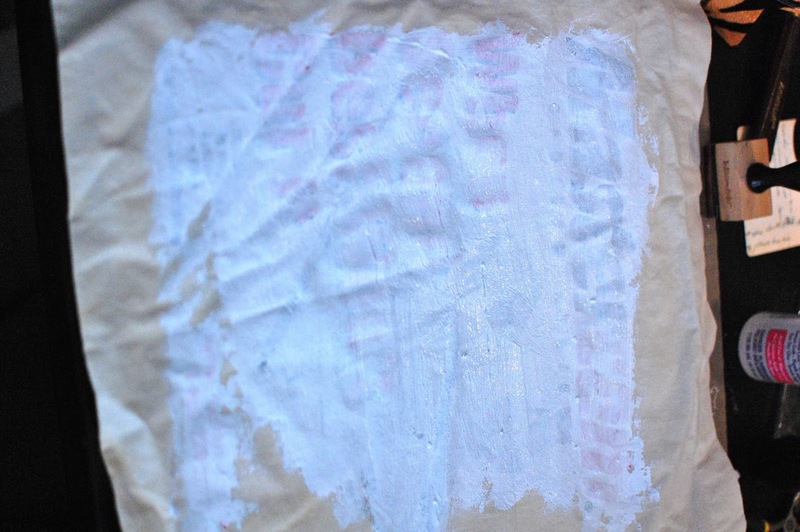 Cover generously with gesso. If you feel you need more coats make sure you dry thoroughly in between coats. Honestly I remove the handles and covered in gesso before dying the handles in order to give my bag some additional air-dry time. 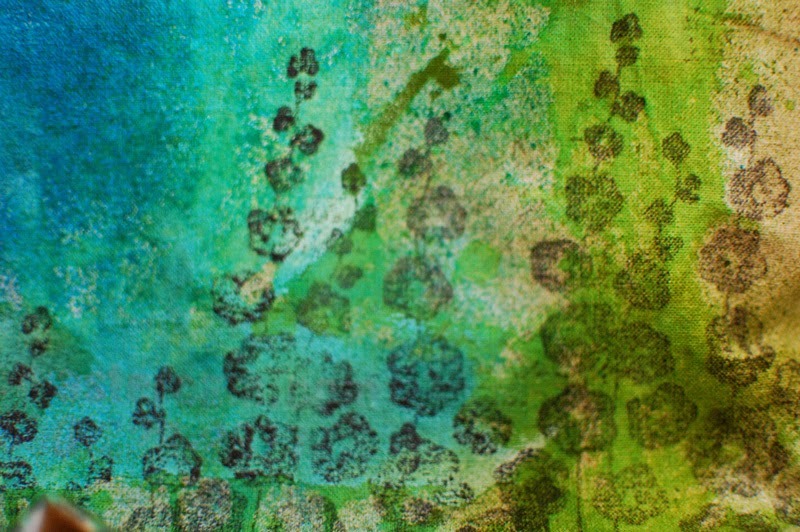 Once covered to my liking I then used Distress paint in Broken China to color the background. 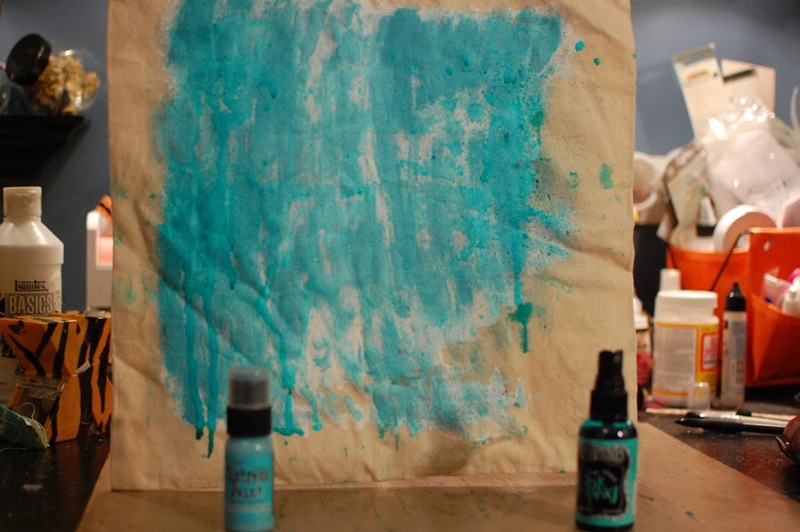 after that was dry I sprayed some Vibrant Turqoise in order to allow some congruency to the piece. I did this to both sides of the bag. 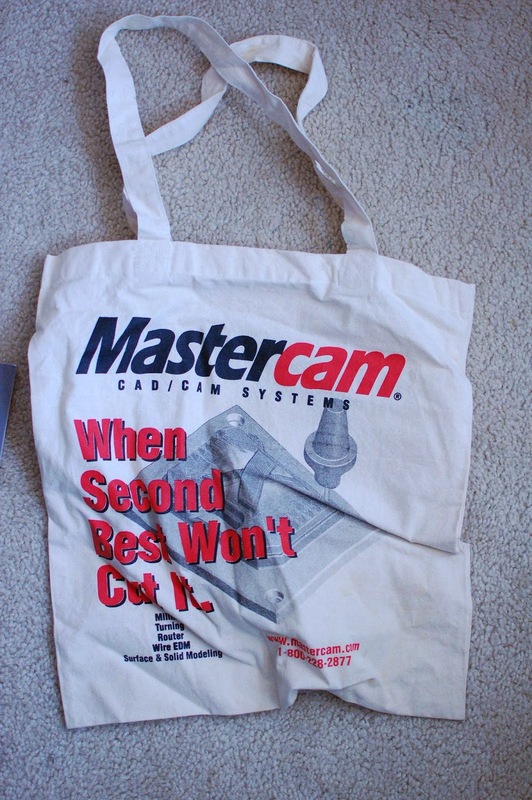 You will want to do the handle next since you need to reattach it to the bag. Make sure your sewing needle is a large enough gauge to handle the material of the bag. I sewed my to pieces together to make one long handle, sewed a piece of trim down the middle, and then sewed each end to the seams in the bag. You can see here where I attached it on the inside. The rest is just like scrapbooking! 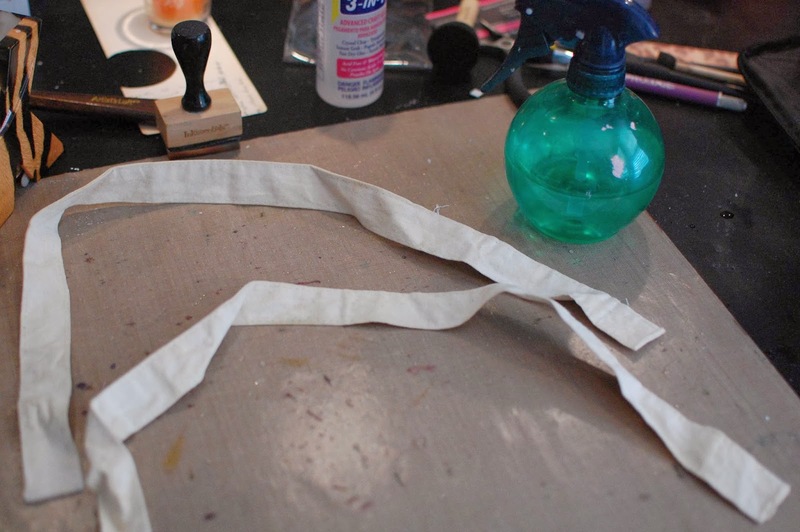 For the front I adhered a piece of burlap using gloss gel medium in various areas. 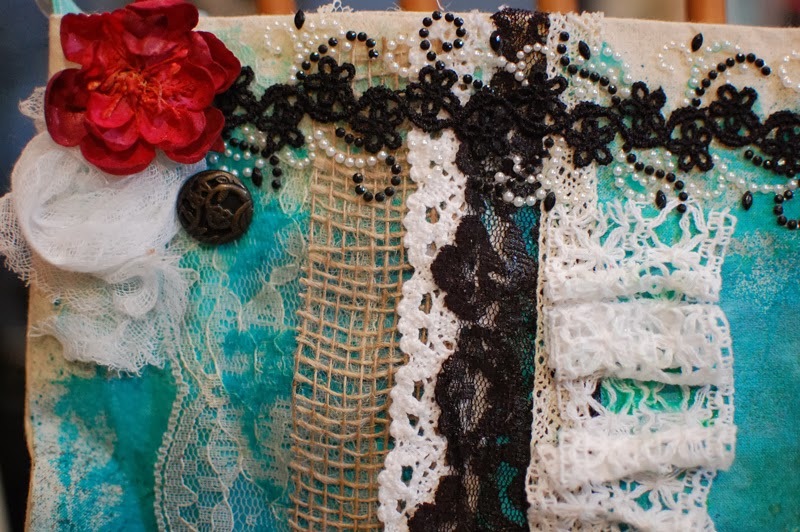 I adhered the large lace at the top using the same method and allowed that to dry. Arrange your clusters and take photos so that you know where to put them when you're ready. Next I used Wendy Vecchi embossing paste in black through a Martha Stewart silk screen to attain the large black shape (Above) and the smaller one coming out of the bottom of my cluster. 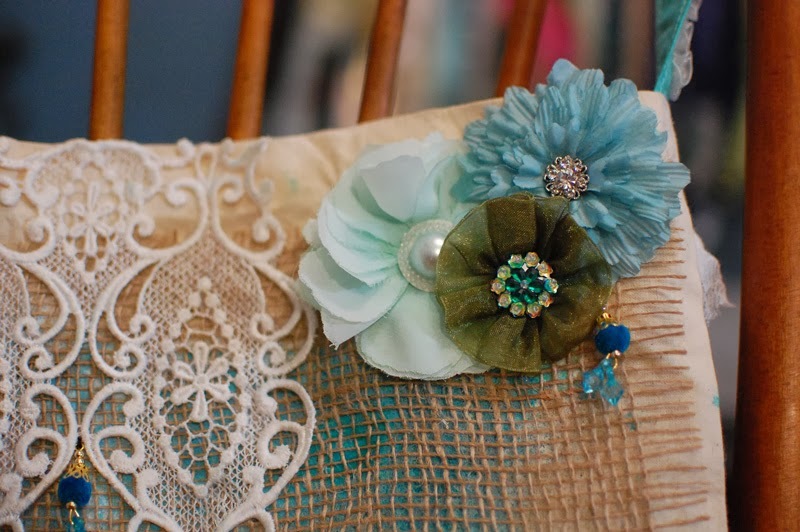 I then adhered the flowers with fabric glue in my hot glue gun and I sewed the small blue Prima baubles on by hand in the bottom cluster, top cluster and across the lace. For the back side, I gave a good coating of water and then added more Dylusions in Calypso Teal and Dirty Martini. and added a script stamp in Stazon Timber Brown. Notice that I even stamped on the lace. It's subtle but a nice touch. I used a leftover scrap of cheese cloth to make a rosette with a slight tail, added an altered flower that was leftover on my desk, a random button that was sitting there, and finally added the Prima border. 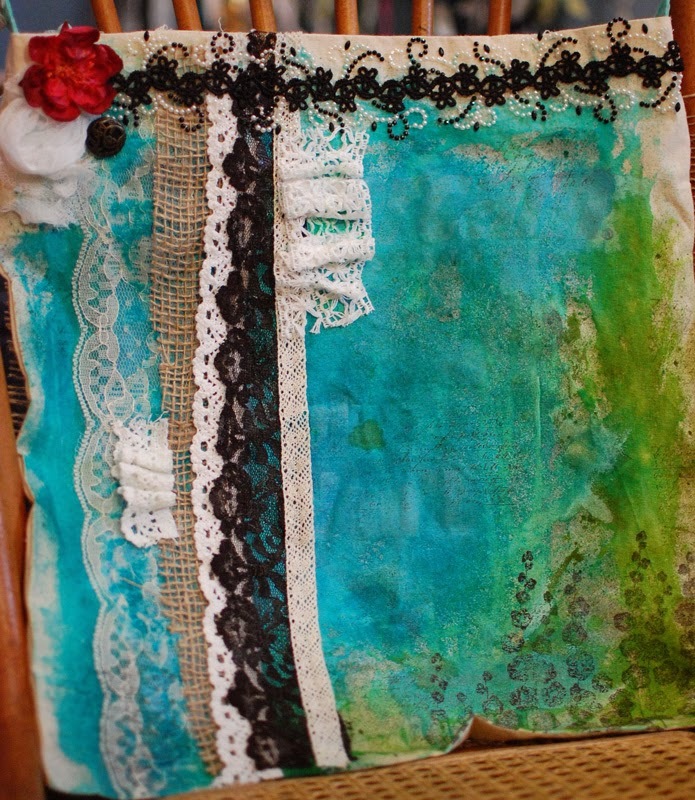 Again I used gloss gel to adhere the Prima border so that it was sure to stay. I definitely think I've redeemed my prior shame of altering a bag. I quite like this one. I hope you play along for a chance to win!! Wow! You certainly redeemed yourself with THIS Gorgeous bag! 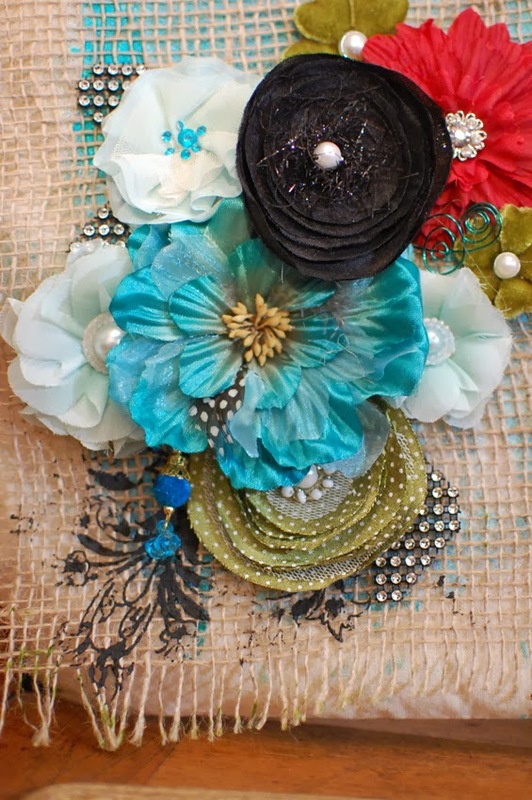 LOVE the different layers and textures and FAB colors! 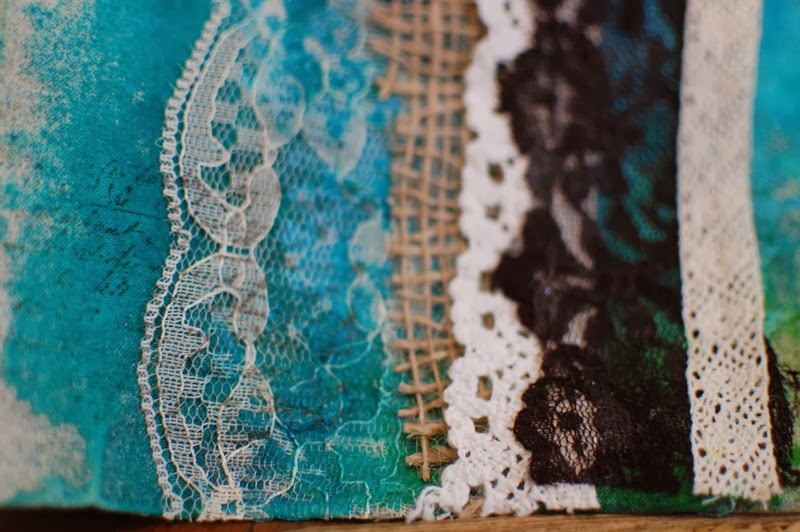 LOVE that you even stamped on the lace! Wonderful creation, Andie! What a fun idea... makes you wanna try one ! 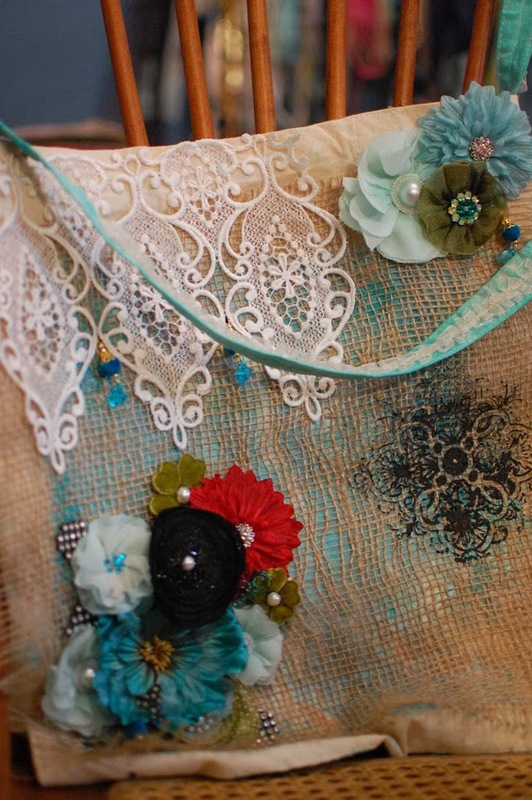 I so love the burlap and flowers !! Oh wow a stunning transformation. Love the textures with the fabrics. Wow, what a change! I'm curious...did you do something to make the Dylusions permanent? I'm wondering if they would get wonky if they get wet. awesome! 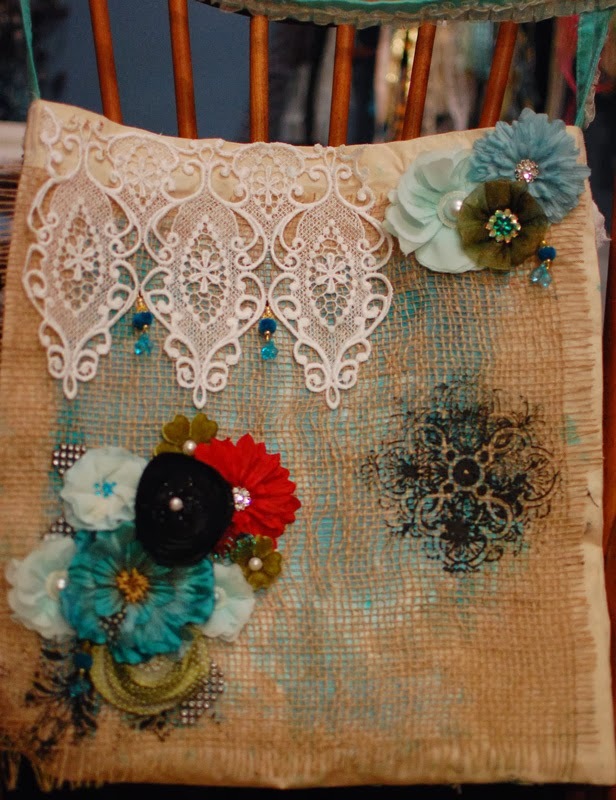 I have a little burlap bag I'm thinking about altering now that I've see your techniques. Simply gorgeous, Andie! You've inspired me...pulling out a small canvas bag I just happen to have...to be continued!